Host Maryfran Johnson talks with Mojgan Lefebvre, CIO for Liberty Mutual's Global Specialty business, about how the insurance firm is leveraging the cloud, creating business-specific data strategy and getting the best from its acquisitions. 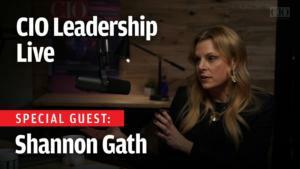 Maryfran Johnson: [00:08] Hi, good afternoon and welcome to CIO Leadership Live. I'm Maryfran Johnson, Executive Director of CIO Programs here at IDG. I have the great pleasure today of talking with and interviewing Mojgan Lefebvre who is the Senior Vice-president and CIO for Liberty Mutual's Global Risk Services. [00:28] Mojgan has a very big, and just recently getting bigger, job at Liberty. A recent promotion expanded her role to encompass the global specialty business reinsurance and commercial insurance products and Liberty's 2017 acquisition of Ironshore which is a multi-line specialty insurance provider. [00:47] Liberty mutual, as many of the people in the Boston area know so well, is a number 75 company on the Fortune 100 list. It's been around since 1912. Today it is the fourth largest property and casualty insurer in the United States, with more than 39 billion in revenue, a presence in 30 countries, and a workforce of more than 50,000 people worldwide, about 4,500 of those IT professionals. [01:14] In addition to her CIO role at Liberty, Mojgan is also a lecturer with the MIT Sloan CIO Leadership Development Program. She serves on the board for Women in Insurance Leadership. 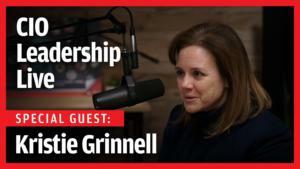 [01:27] Before taking on her current role, she was the CIO for Liberty Mutual's Global Specialty business, and before that, the Commercial Market operation. Prior to joining Liberty in 2010, she was Corporate CIO for bioMérieux, a global medical device company. [01:43] Great to have you here today. Welcome. Mojgan Lefebvre: [01:45] Thank you, Maryfran. Great to be here. Maryfran: [01:48] Let us start off by talking about all of these different business lines that you have under your charge now as CIO. When we talked just a few days ago, you were all about global specialty. That is actually a whole world of insurance that most of us are not familiar with. [02:04] We understand property and casualty, and all that. Explain just a little bit about what your role encompasses now. Mojgan: [02:13] Global Risk Solutions really encompasses all of what was Global Specialty plus our large commercial insurance, which is as you say, the property, auto, workers comp, etc., and then, what is our reinsurance business as well. [02:31] Within the Global Specialty business, I think of that as really very high risk that we insure. Those are unique risks that really large organizations and large corporations acquire. It can be anything from the insurance that you get for your executives, for directors and officers, to unique things like errors and omissions, to oil and gas, things that you don't hear about all the time, very unique high risks. [03:02] The volume is not that high. It's really each unique risk that's quite high of a risk. Maryfran: [03:10] What's an example of one of those highly risky things? Mojgan: [03:14] Again, we could insure a large construction. For example, unfortunately, when 911 happened, quite a bit of the buildings that were insured were parts of some of what we had insured. That can be one example or perhaps, airplanes as part of a military force. Those are some examples. Maryfran: [03:45] These are pretty enormous high-value products and projects. Maryfran: [03:51] Let's talk about the IT group that enables and supports all of this. 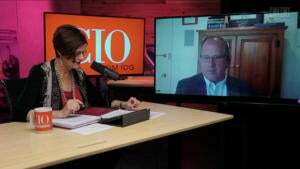 One of the things I always like to ask CIOs about is how the IT organization has been evolving in the last few years. As we all know, technology is at the heart of everything companies do today. It's especially true in insurance. Along with that, there is an acceleration that has happened with the role that IT plays with the business. [04:19] Talk a little bit about how you have been involving the IT group. You've been in leadership positions for eight years now, Liberty Mutual. Maryfran: [04:28] I imagine eight years ago things looked a lot different than they do today. Mojgan: [04:32] That's right. I joined Liberty, July of 2010. I'd say at that time, the IT group was probably seen more as a group that was more siloed on its own. There was a group of individuals that sat really between the technology team and each of the specific functions, and were, to some extent, the translators between technology and the business. [04:59] I found that quite unique and very different from what I'd experienced before. I had always been used to having technology team members directly interact with the end users. I saw that as quite different. It was something that I took on right away. I said, "Well, why are we doing this? Why is it that every meeting I go to, I actually have a business systems person and an IT person?" [05:23] That is something that, over time, has evolved. I'd say the evolution has been driven by different things. I would say the most effective and probably strategic driver of the change is our Agile transformation. [05:38] As we look at the world around us, and as the world around us has become very different with technology really changing the face of every business, be it retail or manufacturing. Insurance is no different. We've seen technology companies enter even the world of insurance now. [05:56] Granted, there are more on the consumer side now, but certainly they've started to also come into the commercial and the specialty lines as well. To some extent what we've told ourselves is hey, if we don't disrupt ourselves, if we don't change the way we work, and if we don't let technology become really a big part of how we deliver our business and how we innovate, someone else is going to do it to us. [06:21] As a technology organization a couple of years ago, we truly said we've got to become a technology organization. We've got to become a software organization that delivers software the way these successful software companies like the Amazons and others do. [06:38] The way we build software needs to change, and we've got to be embedded in each of the business entities where we're driving the build of that software. We've started to truly align with them and really have product owners who are business people, who truly represent what we need to build. [06:58] It's a complete transformation that we've been going through and we're still going through. Maryfran: [07:03] I think what's interesting, we've talked about the transformation at Liberty a few times because you've spoken at some of our events in the past. I remember when you were running your first hackathons. That must feel like kindergarten now, because you've done so many of them. [07:17] The scope of the transformation, and even the Agile nature of it, you're not just talking about IT. You're talking about other parts of the business. That's always an interesting cultural change for any company. 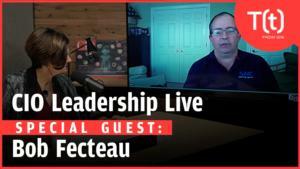 [07:31] What are some of the things that you tried to do as the CIO, and as a leader of the IT group, to get the rest of the business involved in the product owners and just the whole ecosystem around an Agile transformation? Mojgan: [07:49] One of the things that we as CIOs always say is that a CIO is not only a technology leader, but we're probably first a business leader, and so you have to understand the business, you've got to understand why you're leveraging technology and using technology. [08:04] I'd say we've come full circle, where to some extent now there is a little bit of an onus on nontechnology people to understand technology a little bit more as well, and to own and be accountable for when we're building something. It's not just about, I'm going to tell you what and then give it to you, and you're going to build it. [08:25] It's, we're going to work on it together. Some of that prioritization and deciding if I'm not going to get something, what I'm going to get, is also on some of the nontechnology people. [08:38] I'm trying to make sure that my peers and others understand technology more, they understand the roles that are within technology, they understand what they're accountable for and what they're responsible for, and that they're truly bought into the fact that they co-own the success of any technology build that we do together. 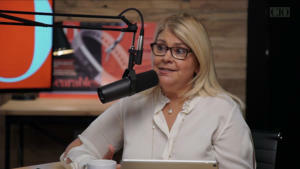 Maryfran: [08:59] I've had so many CIOs talk about the way their business colleagues applaud the idea that we're going Agile because they're like, "Oh, well, we're going to get stuff much faster. You people are finally going to get on the stick here." Then they're so shocked when they find out how much of the work actually involves them as well. Mojgan: [09:18] That's true. For the product owners we have to have fully dedicated, or at least almost fully dedicated, people from the business who are responsible for that. It's not that we're telling them you become IT people, but it's more, you've got to be fully engaged and own the responsibility. That's very true. Maryfran: [09:36] It's nice too because I've always envisioned the bridge that exists between IT on one side and the business folks on the other side. It always seemed like IT is the one that has to go further over the bridge to engage. [09:48] I feel like with the Agile products and projects that I've heard described recently in the last year, I feel like there's more meeting in the middle now. That there is an expectation on both sides that there is work involved. Mojgan: [10:02] That's true. I'd say we're equals. We're all part of the business. The old adage where we say IT versus the business. It is no longer that. We're all different parts of the business. [10:16] This really drives you more and more towards that, where you've got the underwriters sitting with the technologists and they're talking, and they're all engaged. Each performing a different role, but they're all truly engaged. Maryfran: [10:31] That switch away from thinking in terms of projects and thinking more like products. It's a powerful undertow right now in IT, and I think it is bringing a lot of technology organizations much more to the forefront in their own companies. Just the way that we talk about IT and the rest of the business today is starting to change. Mojgan: [11:13] [laughs] I love that. Maryfran: [11:16] Yeah. I like the phrase, IT and the rest of the business, because it's much more joined at the hip for real. Mojgan: [11:21] Yeah, or sometimes I say technology people and nontechnology people. Maryfran: [11:24] That's a good way to cover it too. Mojgan: [11:27] Now the interesting thing, Maryfran, is, so Agile is not just about building a technology solution, right? Mojgan: [11:33] You can do many things Agile, so in insurance we've got a lot of insurance products. One thing about specialty businesses that we've got hundreds of specialty products, and our teams are actually quite innovative and our underwriters think of new insurance products all the time. As they introduce those they bring them to market. [11:53] The great thing has been, they love the idea of Agile, where they're like, "Oh, OK. We don't have to take a year or two to bring an insurance product to market. We can think of it from a minimum viable product perspective and iterations." Maryfran: [12:05] We can see something in a few weeks, and then we can try it out. The fact that everyone on the team has to come back with the customer input as well. That it can't just be a bunch of people in a room making up a product. It's eventually going to revolutionize everything for companies. [12:24] I think that we're in the midst of that now. It reminds me of that William Gibson quote about the future already being here, but just unevenly distributed. Agile transformations are like that for a lot of companies. Mojgan: [12:36] The new software companies operate that way naturally. Every day they are making their interfaces better. Amazon, every day you use it, you're really using some things that probably didn't exist hours ago. That's what we're trying to work towards and become more like. Maryfran: [12:55] It's a terrific goal. Like many of the CIOs I interview, you don't play just one role. Among your many CIO responsibilities you're also the CIO for an acquisition last year, Ironshore. Essentially you brought, [inaudible] say start-up. Tell me a little bit about that business and bringing it in. [13:17] I know you've been involved in start-ups back when you were with bioMérieux, but this is a little new for Liberty. What's that like? Mojgan: [13:25] Maybe in the world of insurance you can call it a start-up, but it's a two billion dollar company, so I'd say in general it's not really a start-up start-up. Having said that it's a very start-up culture, it's a very innovative culture. They're not bound by some of the processes that as a much larger organization we may be. [13:47] Really making sure that as we're bringing them into the fold of the company, our processes, and our systems, that we enable them and give them capabilities, and yet don't stifle that innovative nature. It's a great balance, and these integrations, they're hard to do because you've got to do it while the business is working, so you've got to make sure you don't break things. [14:12] It takes a lot of planning, lots of conversations. I would say a lot of communication and really changed management, and making sure that everybody agrees to things, holds hand, and is aware of what we're doing. There are multiple things that we're doing. One is the infrastructure integration. [14:32] We're insuring that they're on our network and all of our infrastructure and all of the capabilities that we have, collaboration tools and everything. That's one thing that we're doing, and then there is the financial integration side of it to ensure that we've got consolidated financials and reporting, and so on. [14:50] The rest of it becomes all of our systems. That's the hardest part. One of the things that we've learned as we've done integrations over the years is, instead of looking for the perfect and looking for the best of each world, it's almost like best to decide that there is one ecosystem that you're going to go towards and go towards that. [15:08] Because the toughest thing becomes when you create these integrations where there are multiple data integrations back and forth. That can become really complex, and that's where some of these things fail. Maryfran: [15:20] Because some of the statistics about mergers and acquisitions and the huge percentage of them that don't work out the way everyone hoped they would. It's one of the biggest black eyes in the business world as a whole, how difficult it is. [15:34] You really struck on what is often the missing piece there, is the transparency and the communication, and all the extra communication that you have to keep doing around it. Mojgan: [15:44] That's right. You acquire a company for a set of things that it comes with, and sometimes I think once people acquire the company then they forget and they try to change that. I think that's one thing that Liberty's been really great at as we've done acquisitions, Safeco and Ohio Casualty were some of the earlier ones. [16:02] We've been careful and tried truly to maintain some of the capabilities and some of the positives for which we've acquired companies. Maryfran: [16:11] I'm just remembering that I forgot when I launched into my conversation with Mojgan that we are open for business on Twitter. If anyone would like to tweet in a question for Mojgan we would absolutely welcome your tweets. It's #cioonlinelive, and we have folks that are watching for it and will let us know, so if you want to ask a question directly, please do. [16:36] I wanted to switch gears a little bit and talk about...We were talking about building a true technology provider inside of the company. One of the examples of what you were able to do with that was the launch of Workgrid last October. In fact, it just won an award, a Digital Edge award, from IDG that I guess you'll be picking up later this month at our agenda conference in Florida. [17:03] I wanted to talk about the role that your group and the others played. Explain what Workgrid is. Mojgan: [17:08] Workgrid Software, it's actually a software company that we've launched. One of the first solutions that's in it is a digital assistant that companies can leverage and configure towards their needs, and which really makes life easier for them. [17:25] This is a solution that came out of our central IT group, so it's not specific to my group at all, but certainly I work very closely with that team and have seen the great work that they've done. The way that it came about was based on some work that that team did for ourselves internally within Liberty Mutual. [17:44] One of the pet peeves that a lot of our executives had was the fact that they couldn't do a lot of approvals on their hand-held devices. As an executive you're really traveling most of the time, and it almost felt like, the moment you would move away from your desk would be when all those approvals would come in, they are time-sensitive. [18:05] To create a way where any of those approvals be it an HR approval or procurement or anything like that for it to come to one place into one tool and for you to have the ability to review and approve it, it sounds very simple. It was incredible and the team developed it. [18:24] Again, they absolutely applied Agile approaches to doing it. The first version of it was very basic, very simple, but it really answered a problem that was there and since then it's been increasing in capability. When we saw the success in the organization, we decided that this was probably something that we could leverage elsewhere. [18:48] In order to ensure that we maintain that innovation and that startup culture we said, "Hey, we can start a software company that would be separate and independent from the IT organization." This would be one of the first pieces of software that would go in it. Yeah, the team is extremely excited to have won the award and we are very proud of it already. Maryfran: [19:08] This probably will be a great transition to talking about how you approach innovation at Liberty. A company with 50,000 people around the world, it's not like you can just have a Facebook page where everybody throws an idea out. Maryfran: [19:24] There has to be some structure. 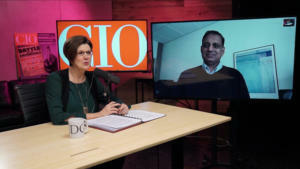 Talk about the way as the CIO how you get innovation going both in the IT organization and connecting that with other parts of the business. Mojgan: [19:40] Sure. That's the great thing. Really there is no one group that owns innovation per se so I think it's quite powerful. Now, in order to start and in order to ensure that we created some centers of expertise, we certainly did have some efforts that were centralized but now it's much more diffused and in different parts of the company. [20:02] Within the IT organization, we formed a group that was to come up with ideas and structures and things that we had to do and probably more than anything to create a culture of innovation. This was two, three years ago that we created that group and so they came with multiple things that we did. [20:23] We had efforts that we did with IDEO, the organization that's all about design thinking. We had our management teams that did quite a few sessions with that group and truly learned the way that you need to think about innovation and think about the viability of the ideas, the feasibility, and ensuring that you are getting the inputs of the end-users and all of the design thinking principles. [20:49] Of course, that's also where we established what we call Ignite. It's our hackathon and it's once a year, a 24-hour event where we bring dozens of our teams from all over the world both technology and nontechnology people together and they have ideas and they develop them and we've got prizes that go with that. [21:07] Then we've got innovation that's happening across the organization as a whole. We've got our Solaria Labs which is a lab stimulus part of environment that truly focuses on disruptive technologies and innovation. There they are focused on vehicles and autonomous vehicle technology on the shared economy and connected home. [21:32] Those are three areas in the insurance industry that are pretty critical and so we are trying to make sure that we are investing and innovating in that area. Maryfran: [21:40] Does this become something that teams are assigned to it they can work on it 100 percent of the time or is it the famous 20 percent of your time? Mojgan: [21:49] No. These are actually dedicated employees of Solaria. Mojgan: [21:52] These are people that are truly focused and employees of that organization because we feel like if they are going to do that effectively it's got to be 100 percent of the time. [22:03] Within the IT organization, we've certainly tinkered with the idea of having folks spend part of their time on innovation. [22:10] To tell you the truth, we haven't really struck the perfect decision. I know there are companies where you hear every Thursday or Friday or a part of it is innovation. [22:19] We just feel like innovation happens. You can't have a specific day where it happens. If people have ideas we encourage them to bring them forth and so hopefully, as part of the hackathon and other venues it will come through as well. We sponsor a lot of accelerators like the MassChallenge, Techstars, MIT $100K. Maryfran: [22:39] You are involved in HUBweek here in Boston. Mojgan: [22:42] We are also involved in HUBweek, exactly. We are also engaged with startups. There have been startups that our company has invested in. We really think of it as a way to learn from them and then of course, also create partnerships between those organizations and ours. [23:01] We also partner with universities. We partner with MIT H-Lab and are open to other venues as well. There's a lot that the company does to ensure that we are innovating all the time. Maryfran: [23:14] One CIO I was talking with said that he didn't want to establish...It's funny. I find CIOs fall into two categories. They are either really strongly believe that innovation needs structure and deliverables and all those project constraints, and there are other CIOs that really would rather create an environment for it and encourage everyone. [23:35] One of the really cool ideas I heard of about was to have a day a week where all meetings are forbidden so people get a chance. Maryfran: [23:44] Someone else said where they take four hours a day and people stay off email and maybe do some reading and thinking, and just relaxing into thinking about ways to make life better with their IT. I think that stuff probably has more mileage on it than the structures. [24:04] A few CIOs I know who are more now the fans of unstructured innovation approaches had at some point in their careers dealt with very structured things that collapsed under their own weight it's what they often talk about. It's a constant wheel of trying different things. Mojgan: [24:23] Yeah. It's a mix really. One of the things that we said was as part of our innovation work stream was it's really about creating a culture of innovation more than anything. You are getting that mindset. [24:36] There a lot of people who say, for example, Netflix and all the innovation they do it comes from the fact that they've got a culture where it's OK to experiment. It's OK for everything not to succeed. [25:02] I keep going back to the Agile transformation, but I think there are so many things that it brings. One of the things was if you are set up Agile, you are not always thinking of these multi-year, multi-million dollar investments. It's about small incremental steps. Maryfran: [25:17] You are learning as you go. Mojgan: [25:20] Exactly. It naturally results in a much more innovative type of culture and mindset and approach. [25:37] I remember a University of California professor that I thought was a brilliant lecture years ago, said that creativity comes from conversation. He was a great believer in just some little spark happening in your head as you are listening to somebody describe it. Maryfran: [26:13] I had someone use the phrase the other day "time poverty" and about how one of the things he's struggling against is time poverty. I can imagine most managers would shudder when you think about the notion of like, "Well, take 20 percent of your time and do whatever you want." Maryfran: [26:30] It's useful. How do you actually find that? It's just an ongoing struggle. I wanted to loop back to a point we made when we talked about the Agile transformation. [26:42] You said one of the interesting outfalls from that is how IT planning and budgeting is different now and that's changing. I want to talk a little bit about that. You said you are realigning the tech finance function in ways that planning is different. Maryfran: [26:59] Explain what you mean. Mojgan: [27:00] Again, it's no longer about projects. In the past, all of our planning has been, "OK. Let's see what are the list of projects we have and for each one of them what are the resources internal, external, exactly how much it's going to cost." It's always wrong by the way anyway. Mojgan: [27:18] You are always estimating and the estimates are inaccurate and it's almost being accurate in your inaccuracy. Maryfran: [27:25] That's where those project statistics come from when a researcher says 70 percent of projects fail or 85 percent of them are late and it's because everybody is guesstimating up front. Mojgan: [27:36] That's right. Regardless of how much you say these are estimates, people forget. They become very accurate. Maryfran: [27:43] All of a sudden, it's they're written in ink, not pencil. Mojgan: [27:48] [laughs] We are not manufacturing gadgets so you can't really say, I know exactly this is how much it's going to be. Now in the world of Agile, it's much more about software products to which you've got teams. [28:03] One of our philosophies is you want those teams to be as permanent as possible to be together because again, you want the teams to learn each other and you are really bringing the work to the teams. [28:14] To some extent budgeting and estimating becomes much easier and we do it in increments. You can say, OK, for this set of products, we've got two teams and you know exactly how many FTEs the team is made up of and that's your budget. Then we do the planning. The specific planning we do on what we call program increments and they are on a quarterly basis. [28:39] At the beginning of each quarter, the teams -- and these are the joint business and nontech -- I should say technology and nontechnology or your other functions and the technology teams getting together and really planning the specific capabilities that they are going to focus on as part of their Agile backlog over the next three months. Really, prioritizing everything that they are going to build. [29:04] As we know when you go to build software, you may think something is going to take a specific amount of time and it may take a different amount of time. Again, it's the scope that may change over time so what you deliver may be slightly different. The number of people engaged and the cost of delivering that will be the same. [29:24] We are trying to really align how we budget and how we control much more with this methodology. It's no longer about projects but it's about teams and what they are going to deliver and the metrics that go with that. Mojgan: [29:50] At least not on the software development side. Now I have to tell you this is a huge mindset change. It's not just about the practices, it's also...Even myself, I have to keep thinking. I can't say how much is this project going to cost and we've got to keep thinking differently. We are changing the way we govern. [30:16] The way we used to govern investments and projects before was at the beginning when a project was going to start. We would bring the estimates and the business case in and we'd have an estimate and we would call that our commit one and that was our first level estimate. Then where we would do the design we'd have much more specifics, we would come for a commit to. [30:37] All of that is changing and it's no longer about that. Again, it's about much smaller increments that get delivered within a program increment being a quarter, and so it's the program increment that comes to our steering. [30:52] Everybody understands that the team will do their best and they'll deliver based on the priorities of the business, but that it's not to the level of minutiae that we would do before. Maryfran: [31:02] I'm trying to imagine how CFOs would feel about and react to this. That must be one of the mindset changes that has to happen. Mojgan: [31:11] It is, absolutely. I'd have to say, our CFOs have been fantastic, in that they've truly listened and they buy into the agile transformation. What's been very helpful is everyone, from our CEO to our CFO and all of the organizations underneath, philosophically, absolutely believe in that. It's really working hand in hand with them that we've come up with the methodologies. [31:38] The other thing that it changes is, again, with Agile teams, you basically support what you build. It's no longer about, this team builds it and then gives it to another. Maryfran: [31:48] That's right, you're not one and done. Mojgan: [31:48] The whole measurement around how much do you spend on build versus maintenance also starts to go away, because we used to measure that pretty religiously, where we'd say, "We wanna be spending more on building and less on maintaining." It's no longer that philosophy, it's, "You're building something, and when you build it, you've got to take care of it." Maryfran: [32:10] You're committed to it. Mojgan: [32:11] It's the same team. Hopefully, it also instills a much better behavior, in terms of quality. You're going to support what you've built, so you better build it well. Maryfran: [32:22] It builds in the ownership of it, going forward. That's something that, that's probably the bad old days, when it was business requirements came over the wall and IT worked on it for a while, and showed it to the businesspeople and they didn't want it, things had moved on. That vicious cycle that everybody was in, it's turned into more of a virtuous cycle now, where everybody has got skin in the game. Mojgan: [33:08] Yeah, it's a software development approach, that's right. Maryfran: [33:11] Yeah, it's a software development approach. I've also noticed that a lot of organizations that were, a few years ago, very busy outsourcing their technical talent, now technical talent has a whole different value on it. Mojgan: [33:23] That's very true. Maryfran: [33:24] Tell me about your recruiting and retention efforts. What are the things you do as a CIO to get talented IT people to want to come and work for an insurance company that was established in 1912, versus a startup? Mojgan: [33:42] Great question. You're right, it may not be obvious to people that as a software developer going to an insurance company is exciting, but I have to say, "Hey, we spend a lot of money on technology." We spend one-and-a-half to two billion annually, in general, so we spend more than a lot of companies. Maryfran: [34:04] More than the size of a lot of companies. Mojgan: [34:06] Exactly, you can start to get pretty excited. Why? Because data is, really, the most critical thing that any insurance company has. Ensuring that we're building systems that give you that data, is a big deal. [34:19] We certainly have a big campaign to ensure that we are seen and understood as an innovative, technology-driven organization where, if you come as a developer, as someone in the IT organization, you are working on exciting projects, you are building new things, you're learning new skills, and you're truly at the forefront. [34:42] It's very different from what one might imagine an insurance company being, so we did a lot of work with our marketing organization in ensuring that we're creating that brand. When you go on our website, you see a lot of that look and feel. [34:57] Then, we've also now made sure that we've got our teams, be it our engineers going out there, speaking at conferences, ensuring that people understand some of what we're doing. [35:07] We've got folks who are, really, viewed as some of the forefront of technologies, like artificial intelligence, and other areas, where we're totally investing - blockchain. I can list a whole set of things that we're investing and doing real work in. [35:25] We've got our people going out there, and we're seeing a very positive outcome, from people getting excited and understanding and coming to us. We are competing, in some case, with companies like Google and others. There are some instances where, for multiple reasons, someone may choose to come work for us, as opposed to another company. [35:51] We can still continue to improve and get better. We've done a lot in this front, and very excited that we're going to do more. Maryfran: [36:01] Let's talk a little bit about those emerging, exciting technologies that come up a lot -- robotics, augmented intelligence, machine-learning, blockchain -- doing work with these technologies, does it fall in your innovation efforts, or is it woven into the fabric of various parts of what IT is doing? How do you figure out where that all lands? Mojgan: [36:28] It depends. First of all, with every single one of these technologies, our goal is to leverage them as much as possible, with the goal of having all of our employees to truly focus on much more value-added work. [36:45] If there's anything that is repetitive and so on, we can leverage technologies to do that, so that our employees are really doing the exciting, where the analysis, and where the human brain is required. That's the one thing. This is really what we're doing. [37:01] RPA, for us, that's a much more basic type of technology, and that's something that we're using where, maybe in the past we had our underwriting assistants put data into multiple systems. We've now leveraged RPA in multiple places, where we're taking that rote work that they hated away from them. [37:21] Now they can really focus on their underwriting job, and we're having Blue Prism, or other kind of RPA technologies do this work up. 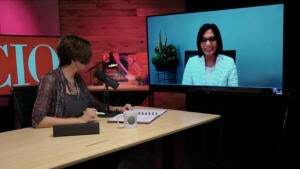 Maryfran: [37:30] RPA is Robotic Process Automation? Mojgan: [37:32] It's Robotic Process Automation. To some extent, you can say some of the technologies have been around for a long time. Maryfran: [37:37] They have. When we talk about automation in IT, sometimes I see the CIOs rolling their eyes and they're like, "This again? We've been doing automation," but it's automation that is truly happening much more in the background. Mojgan: [37:50] Yeah, in a way, it's like back jobs that are running in the background. If you can define it and it's repeatable, then you can have a program that's running in the background 24x7, do that, instead of having to involve a human to do it. It's nothing that they're really using their human capabilities for, so it's replacing some of those things, and that's what's RPAs. [38:15] Now it's getting more and more sophisticated, where now there are some more cognitive capabilities that are getting added to it, and we're experimenting with that. [38:25] To your question of, is it part of the fabric of what IT does or is it innovation, I'd say it's a mix. We certainly want to make sure that before we commit to, "Hey, I'm gonna use this to solve this business problem," that we've actually played around with it. [38:43] When it comes to a new technology, we always do a proof-of-concept, to ensure that we prove out that things can be done, so we've got proofs-of-concepts going on. Once could say, "Well, is that innovation or is that...?" It's both. It's innovation towards learning, so that we can actually, really, use it. [39:03] Then, there are some instances where our technology partners come to us and they want us to start learning some of the technologies they have. We may not, necessarily, know right away what the business use case is, but we know that there is some, and so sometimes that's where we do more of an innovative proof-of-concept with them, with theories around the possibilities of using those. [39:29] In the artificial intelligence realm, we've got access to a lot of data. We know that our ability to mine that data, whether it's text mining or other things, can be very strong. We're experimenting with lots of different types of technologies, from artificial intelligence to others, to try to learn and make advancements. Maryfran: [39:55] I was interested in it, when I think of people that have absolute lakes and mountains worth of data, you do tend to think of financial industry and insurance industry. [40:06] When we talked before, you said, within global specialty, when that was the one you were running, you didn't have a Chief Data Officer in that unit. What is Liberty's overall strategy for data and your own way that you parse it out? Do you have a separate data analytics? Is there a Chief Data Officer somewhere who's in-charge of all the strategy? How do you set your data strategy? Mojgan: [40:34] I would say, each of it is specific to our business entities. Of course, now with our new business entities, it's going to start to morph, probably a bit more similarly within each of the entities themselves. [40:46] We don't have a general strategy outside, across the entire organization for that, because we believe that data's very specific to your business. We want to make sure that it's as close to the business and the business problem as possible. Maryfran: [41:17] What you're dealing with is data. Mojgan: [41:19] Having said that, of course, we've also got the actuarial side of the house, as well, so data and numbers and things like that for us, are a big deal. In many parts of our organization, our actuarial group has analytics teams and people that you might consider data scientists, although again, that term has different meanings. Maryfran: [41:44] The minute you give them that title, you have to pay them a half-a-million dollars a year. Mojgan: [41:49] That's right. There are data analysts who are truly experts at taking data and analyzing it, driving business decisions from it, and building models that can help, whether it's with pricing or deciding if a risk should be written and things like that, so we have analytics teams. [42:11] We've gone back and forth on, should those be centralized in one place and service the different business entities, or should they actually be within the entities. [42:23] As we started our very big focus on analytics, we said, "Let's centralize it, so that we build the center of expertise and capabilities," but with the goal to absolutely then embed it in the business units, because we firmly believe that these things need to be tools that our underwriters and our actuaries have at their hands. [42:44] We don't want it to be dictated from somewhere else. That's the approach that we've taken. Maryfran: [42:49] I had a big, in-depth conversation last week with a whole group of...it wasn't just CIOs, it was a mixture, there were some data officers and various people involved. It all centered around the differences between data strategy, data governance, data quality...they were saying, is just having a data governance approach, how that was different from having a data strategy. 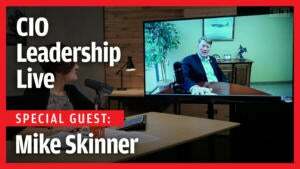 [43:18] One of the questions I asked the group, I said, "Is there an enterprise data strategy that your CEO and your business unit leaders could name right out?" Companies always have a, "We have a customer strategy, and it's this." Is there a need for a data strategy?" When I asked the question, there was crickets in the room. Maryfran: [43:39] People were like, "Why would you want a data strategy? What you want is a business strategy that is enabled and driven by the data that you supply to it," which probably makes more sense. Mojgan: [43:51] I agree, because again, data, depending on what question or what business problem you're answering, is supposed to be an enabler, really. We want data-driven decision-making everywhere, whether it's about the customer, or about our suppliers, or about our agents and brokers. Maryfran: [44:14] With Workgrid, with the creation of your own software company, you now have a data-driven revenue stream that comes from that. I always want to yell, "Bravo!" for that, when CIOs have that going, because you can finally talk about IT as something other than a cost center or an enabler. It's a great trend to see. Maryfran: [44:34] How have the customer expectations around the data that they can get from Liberty, from your various business entities, how has that changed in the last year or two? Can you think of any examples where customers are enabled to do something new and wonderful with data, that maybe three years ago, you wouldn't have given them, or given them access to? Mojgan: [44:57] I would say, customer expectations in the world of any business have probably changed just because of what's happened, and because of the fact that there are companies that give so much to the consumer, that the expectation is, "Well, why wouldn't it work this way? Why can't I go to my website, and go into my account, and see all of my policies, understand my invoice, and see everything?" [45:23] Or, "Why can't I, if I have an accident, be able to just take a picture of that, and then send that in to my insurance..."
Maryfran: [45:31] That's right, text it in. Mojgan: [45:32] Exactly, "...and then get an estimate, or if it's below a certain amount, have it happen as a transaction without having to go in and take my car," and so on. [45:43] Again, a lot of what I'm telling you, certainly is much more relevant on the consumer side, because indeed, that side is the most advanced. That's where you're dealing with your end-consumers, and the expectations are high. [45:57] Our consumer organization is absolutely, at all times, looking at that, and continuing to improve and do more. Some of what I just told you are absolutely services that are there, and more and more are getting introduced. Our competitors are doing the same, so it's not like, if we do it, we're the only one. It's just happening all the time. Maryfran: [46:23] The startup area is the insurtech, those little companies, because I've seen you quoted many times, talking about the need to disrupt ourselves before others disrupt us. It's the new golden rule, isn't it? Maryfran: [46:40] When you look at what the startups are doing in the insurtech area, what are the places where you're most interested, where you look at it and you say, "Well, that's an interesting approach to it. Hmm, by the way, we're doing a little something with that"? What are the parts that you're really watching closely? Mojgan: [46:58] One of the things that we're seeing is that, even in the world of commercial insurance or specialty insurance, a lot of the agents and brokers for the smaller products, they do want to possibly go to a website, like an Amazon website, but go to the insurance company's website and answer a few questions and, really, get a quote. [47:21] They don't want to have to, every single time, call or email and underwriter and go through a long process. [47:28] That's an area that we're watching. We're absolutely launching a few of these broker portals. We've done some of them very successfully, with a lot of great feedback from agents and brokers, actually engaging them in the process. [47:41] One of the things we've learned, and I'd say it's something that we certainly saw with some of the insurtechs, was the simplification of some of the decision-making, and instead of asking hundreds of questions, can you ask 10 key questions? Mojgan: [47:57] How about leveraging a lot of the external data that exists? Maybe if I know your first and last name and something else, then your address and other things I can get from external data sources, without having to ask you so, really, making it much easier for people to do business with us. [48:14] I'd say, those are some of the things that we're watching. We want to make sure that we're aligned with the trend. To the extent that we can be ahead of it and introduce it, we will, but sometimes also you want to make sure you're not ahead of the time, because as much as you try, the customer's got to come with you, as well. 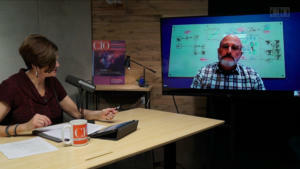 Maryfran: [48:31] I know that the proof-of-concept, and then that agile approach where you get out in the field with things, I had a conversation with the CIO of a big restaurant chain, and they were watching smaller restaurant companies who were doing things with iPads that they would set up...in some airports, you can order right on the iPad. [48:52] They tried it in about a dozen -- they have a chain of 175 restaurants, but they were leisure/finer dining, it was a little further up the restaurant chain than what you find at airports -- they tried it in a few places, and discovered right away that the customers didn't want that. [49:09] They were coming to a nicer place because they wanted the better wine list. They wanted to talk to the server, they didn't want to poking around in an iPad. [laughs] I thought that was a great example of getting out there and trying something, because they were seeing various competitors trying it out, as well. 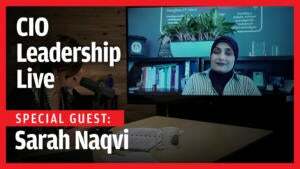 Mojgan: [49:25] I would say, we've become more...Not being afraid of trying things out and saying, "It's OK, because you're right, your customer will tell you." [49:35] One example of something we launched was insurance for people who were taking snow trips. If I'm not remembering the name incorrectly, I think it was called SnowChaser or something. We launched it, we made it an app that was easily accessible. Mojgan: [49:49] We had three, four questions that they had to answer, and it actually was fantastic. We got a lot of feedback as we launched, and then we made the product better. [49:58] I'd say, we're becoming more courageous in how we're leveraging technology, because it's much easier to launch something now than it might have been a few years ago. It's OK to do it and learn from it, and then continue to make your product better. Maryfran: [50:11] SnowChaser? It sounds like a weather app, but it wasn't. Maryfran: [50:17] What did it have to do with insurance? Mojgan: [50:24] Yeah, or if your trip gets canceled, or something like that. Maryfran: [50:27] Interesting. When we were talking earlier, I was interested in, maybe an example of something that was a digital product launch, that shows the end result of the kind of work that you've been doing in IT, and we talked about the Accident and Health Portal, the A&H Portal story in Australia. Tell me more about that again. Mojgan: [50:50] A couple of years ago, our Australian team came to us and said, they wanted to enter the $240 million A&H business. There was an opportunity because some players had left that industry, and they were like, "We need to enter, and by the way, it needs to happen within the next four to six months," because that's when the renewal season is. [51:13] It's not like, we need to launch this, you've got a year or so, we need to launch this...By the way, technology is an absolute integral part of it, because this is one where the agents and brokers absolutely depend on coming to a portal where they place the business. They don't want to be interacting with the underwriter all the time. Maryfran: [51:34] They want it fast. Mojgan: [51:35] Right. Of course, they came to us once the business case had already been approved by the president, so it wasn't like, "Oh, tell us if we can and will incorporate it in the business case." Maryfran: [51:46] This wasn't a proof of concept. Mojgan: [51:45] No. This was like, "We need to do this." It was funny because that was just when we were starting to truly, fundamentally think about Agile and doing things differently. It was also coincident with our move to the cloud and really leveraging a lot of Azure or AWS and other cloud partners. [52:06] My team evaluated the options that we had. One was to go out and buy a packaged software that was out there, except the word on the street was the packaged solutions. None of the agents and brokers were happy with, plus they were very expensive and took a long time. [52:20] The other one was to leverage some of our existing platforms, but again, we knew that those were built on old technologies. They couldn't do a lot of the things that we wanted. Really, it came down to we've got to do this with new technology. We've got to build it and we've got to do it Agile. [52:35] I was like, "You guys are crazy. You're taking this thing and you're almost choosing the highest risk option." The fact was none of the other options would meet the timelines, or at least, even had a chance of meeting the timelines. Maryfran: [52:49] That was one of those highest risk, highest reward situations. Mojgan: [52:51] Yes. If it worked, it would be fantastic. We just had to mitigate the risks. The team partnered very closely with the chief underwriter who'd been hired for this business. He knew that the technology solution was absolutely critical. [53:07] We sent a couple of our developers to Sydney. They went out and started talking to the agents and brokers. This was the first time that the IT team was literally sitting face to face with the agents and they were energized. They were like, "Oh my God, to hear them tell us what they wanted and what was key to them." [53:26] They did the framing for a couple of weeks, then we formed a team. At that time, Richard, the underwriter, he actually went to Belfast where the team was based. He spent a couple of weeks with the team. [53:40] They built the epics and the user stories and they prioritized them. To make the long story short, literally within two, three months, we had the first product available. They did amazing things during this time. This team was able to make decisions on their own. [53:58] They, on their own, decided that instead of doing the portal first, they'd do the underwriting platform first because that would allow them to do it in time. The ability to make decisions quickly with all of the decision-makers within the team was just absolutely valuable. [54:16] Post that first product, and then they added the other products. Literally, within the six months, we had all three product lines within the A&H solution live and in place for the agents and brokers. The beauty of it, being that the strike rate of "to buying" doubled the competitors. [54:39] They had built a solution where they truly listened what the needs were. It wasn't rocket science, it was about truly having that direct interaction, understanding what they were looking for, and then building it, and reacting to it. [54:55] Then there was real time rating and quoting which was, again, unique to the solution. It was truly a success. It wasn't easy. It wasn't easy to change the mindset of all the people around who wanted reports and governance, and so on. [55:11] Having Richard truly bought into it and engaged with the team was absolutely invaluable. It was a great experience. Maryfran: [55:17] You had to practice what Agile preaches. Also, the metrics you got out of it were genuine business metrics that everybody cared about. Mojgan: [55:27] They were. They were. It didn't matter if people said, "But you told me I would get this, and I didn't get it." I was like, "That's right." Maryfran: [55:34] Maybe, in the next iteration. Maryfran: [55:36] Wait 20 minutes. Mojgan: [55:38] They had 30 releases within a matter of months. It was a very different way of working. Maryfran: [55:44] That's excellent. You mentioned the cloud. I was curious about how your cloud strategy has been evolving. You told me you've got about 27 percent of all your compute power in the cloud. Maryfran: [55:58] Is that for your units or for Liberty as a whole? Mojgan: [56:01] That's for my units. Maryfran: [56:03] That's for your unit. Mojgan: [56:04] My units, or at least my units when we spoke. I'm going to go back and revalue. Maryfran: [56:07] Now that you have a bigger unit, and you're looking to double that in the next two to three years. Mojgan: [56:13] That's right. As we look at where our applications should be, where our focus should be, again, we want to make sure our focus is on building business capabilities. Things that other companies can do better than us and cloud companies and other things, like our infrastructure and data centers. [56:32] Over time, we can have all of those, as much of our applications be in the cloud, and no need for us, necessarily to have as many data centers and large data centers as we have. Really, our focus should be on business capability. [56:46] Our goal is that within the next two to three years, we're striving to have 50 to 60 percent of all of our compute in the cloud. We're certainly starting with what we're building new. We're also migrating some of what we have. We're being very thoughtful because we don't want to just move to the cloud just for the sake of it. [57:04] We're going to move things that we think have longevity and they're not going to be retired over the next two to three years. [57:11] Within Global Specialty, we have 27 percent of our computes already in the clouds. We're aggressively working towards getting that number to be higher. Maryfran: [57:19] I remember the initial vendor pitch on all of the cloud movement was how much money it would save everyone. Of course, that turned out to be pretty much untrue. What it does is, it speeds time to market new applications. I've run into so many CIOs who say, "Everything new we do, we do in the cloud, and we don't try to drag the legacy there." [57:59] For us, our Asia Pacific regions where we didn't have data centers very close to them were ones that were suffering with some of the performance of our applications, with the advent of AWS right beside them...Some of the performance of some of our applications, especially our document management applications have truly improved in a huge way. Maryfran: [58:26] I wanted to switch to just more of a personal query. This is, you've been at Liberty as a CIO for 8 years now, which as anyone who's ever read CIO magazine in the past knows that the average industry 10 years is about 5 years. You've fallen into that category of CIOs that I think of as the longevity group where you've been with the company. Your role has been expanding there. [58:51] I just wondered if you had...How you've seen your own role change over time. If you have advice you could offer fellow CIOs who would like to settle in for more, they'd like to get into that longevity club where you stay in a role for several years and obviously have more expanding business responsibilities, what are your own...Your CIO wisdom is what I wanted to tap into a little bit. Mojgan: [59:18] [laughs] I would think, as with any role, there are some things that are table stakes. Clearly, you've got to do your job well. You've got to be viewed as you're performing and then some. Because if you're not doing that, it's hard to make up for that, right? Maryfran: [59:35] Yeah. The foundational stuff has to be flawless. Mojgan: [59:40] Operationally, things got to work. Then it's only once that's working that then you can focus more on the...What additional business value? What about innovation? What about Agile transformation, etc.? [59:55] I'd say, it also comes down to relationships. We're all humans. Ensuring that those relationships are there and that people know you for what you do, but for who you are, and ensuring that those are strong. [60:09] I say that to anyone where they say, "How do I make sure I succeed?" I'm like, "Your performance currency is like a table stakes. It's a given, certainly, ensuring that you've got the right relationships. And that you do for others as much as you can because you never know when that's going to come back and really become something that you can count on." [60:30] I'd say, staying close to the business, truly being there and not thinking of yourself as just the CIO, although Juno just the CIO is a pretty big responsibility. Maryfran: [60:40] It keeps getting bigger. That's the thing. Mojgan: [60:43] Truly, thinking of yourself as a leader of the company. I say that to my team. I tell them, "I don't just expect from you your specific functional responsibility. You're a leader on my team to contribute when and where you can and raise your hands." I say all of those same things apply. [61:01] Liberty's been a fantastic company. I've enjoyed it. It's also about enjoying what you're doing. The great thing has been, there've been new challenges. Every few years, things have changed. That's kept it very interesting and exciting, as well. Through that, that comes into play, too. Maryfran: [61:17] That has helped. Mojgan: [61:17] Really enjoying what you're doing. Maryfran: [61:20] One CIO said to me that he thought that it was very important that once you get a seat at the table, you don't sit around too long. Don't just stay there at the table enjoying how fabulous you are, get out there and strike up those relationships. Work really hard across the businesses. [61:38] We are just about out of time. The last thing I wanted to ask you was on keeping up with technology trends and all the changes in the industry, how do you do that personally? How do you keep aware? What is your personal approach to continual learning? Mojgan: [61:54] [laughs] Read a lot. For sure you've got to read a lot of the trade magazines. I read a lot. I try to read a lot about insurance, but then also read a lot about technology. [62:04] Then, leverage your teams. I've got these multi-hour technology deep-dives that I have my teams organize on different topics. They bring those expertise to us. I ask my entire extended leadership team to attend and to learn. [62:23] Go out when you can, attending conferences when you can. You've got to be mindful, obviously. You can't go to a lot of things, or send your teams out and make sure that you're talking to them. I'd say a combination of all of these things. Maryfran: [62:38] I would say you just mostly mean come to my events. Once you come to my events, you'll have that all covered. Mojgan: [62:44] [laughs] That's right. Maryfran: [62:45] Thank you so much. It's been such a great conversation. I really enjoyed getting a chance to talk about all this. Maryfran: [62:51] I want to thank our audience for sticking with us for our CIO Leadership Live with Mojgan Lefebvre from Liberty Mutual's Global Risks Services business. We will have a copy of this. The video will be posted by tomorrow on cio.com. There will also be an audio podcast that will be posted to Google Play, iTunes, and SoundCloud. 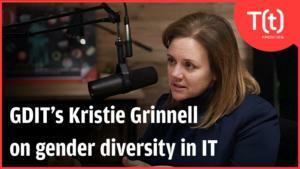 [63:17] Our next episode of CIO Leadership Live will be April 12th, when I will be back talking with Klara Jelinkova, the CIO at Rice University. [63:29] Thank you very much for joining us today. Take care.